While reading an article (via John B’s latest blog) about how awesome my alma mater is at basketball this season, I came across this Wendy’s ad. There was a Wendy’s in UCF’s Student Union. I ate a triple stack once, and I swear to God my heart hurt immediately afterwards. It was like the entire hamburger was trying to slide sideways through an artery or something. I like hamburgers as much or more than the next guy, but there has to be some limits. That said, I always thought Wendy’s chicken sandwiches were better than McDonalds or Burger King, but I think they would still have a hard time as the market is already pretty full. for your sake, maybe wendy’s is not so good. but china stands to gain a lot from the frosty. Actually, I think Shanghai is doing OK without the frosty. It has Dairy Queen and blizzards. The green tea and almond blizzard is pretty damn tasty. At 12 RMB for a small, though, they’re not real cheap, by Chinese standards. Dude, Russell, the Chinese have managed to come up with all sorts of half-frozen drinks (though I’m always leery of them, as they almost certainly make the ice out of tap water). Bah! I used to have the triple stack with biggie fries and a biggie drink all the time! Wendy’s rules! Actually, they had this slogan, “Wendy’s Rules the Night!” During that time, they were all open until 2AM. Yeah, baby! We would like to do business with China. Our name is ChinaBlack and we are based in Cape Town South Africa. Anyone who doesn’t like Wendy’s should be put against the wall imo. Dave Thomas was such a sweet old man and a brilliant marketing ploy. I wept when he passed away. As you all know, I’m a huge fan of crack, but that doesn’t mean it’s good for me. 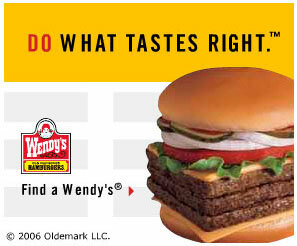 Well, clearly you came to the right man, as a picture of a Wendy’s hamburger on my blog clearly demonstrates. I will have the people of China begging for ChinaBlack hamburgers. Wendys doesn’t heat their buns, and that, my friends, is just lazy. Warm burger and cold buns…we don’t need to export that kind of thinking. I hate Wendys with every things I muster…although I do like the Frosty. Florida hasn’t played anybody yet. They play in the weakest major conference in basketball. They’ll choke in the first or second round of the NCAA tournament, and Billy Donovan will have to go back to selling used cars. Speaking of fast food, I heard that there are some Taco Bells opening in Shanghai. Have any of you guys seen them? Thanks, Mark and Carl, but no thanks to John! And I’m getting ideeeas! Ain’t this a greasy stir-fry country? I generally stay away from fast food (although I always make sure to hit the Burger King in Shanghai and in the departure terminal of the HK airport). However, if a Wendy’s came to China I would be all over that. Wendy’s is a cut above the rest and my heart is eager to take a beating. Don’t start Taco Bell rumors unless you can back them with proof. I doubt we’ll ever see a real TB in China, Chinese people wouldn’t like Tex-Mex. There already is a Taco Bell in Shanghai. It’s just that it’s a bizarro Taco Bell. You have some strange questions, but OK, I’ll give it a go. Fries (unless I want a dessert). Both are potentially very dangerous, but I’ll go with Globalism. I am particularly intrigued by your use of parentheses to indicate the non-serious nature of your response on the drug choice, your use of scare quotes around the made-up alternative to fast food, the hesitation implied by the use of the question mark after “warm” (what provokes the hesitation, I wonder? ), and the use of the familiar “Dave” (have you met him?) instead of the actual choice offered. I draw the conclusion that the only genuine responses for sure are 2, 3, 7, and 8, but I grow increasingly uncertain about the nature of your responses after question 10. However, I suspect this could be the result of fatigue setting in. Ok, you can’t talk about Wendy’s without acknowledging that they have the best chicken nuggets in a fast food chain by FAR. And their 5 piece nugget is on the $1 menu. Brillant. Wendy’s and Taco Bell now both take debit cards, which is also very hazardous to good health. If you’re really interested in the responses, I think in this case your time would be better spent designing good questions than in analyzing the results. A very odd response. I thought researchers always analyzed the results! But anyway, Jon, like you, I am something of an applied linguist. The only difference is that my main interest right now is the use of punctuation to make argument. What I noted in line with this interest was that you were changing the form of some, but not all, of the questions in order to indicate a variety of stances toward the meaningfulness of the choice posed. You did this; not me. Dave Thomas OR Colonel Sanders? Dave Thomas, hands down… because the colonel puts an addictive chemical in his chicken that makes you crave it fortnightly, smartass! Dave Thomas’ Wendy’s for lunch and the colonel’s KFC for supper– after all, what are a few health issues when deciding to eat out? KFC has those multiple-option wing buckets now– good stuff! Honey-BBQ rules! Think I’d love to have a Wendy’s in China when I visit. I remember seeing a KFC in Nanhai, but no Wendy’s. Course, last time, I was only there 6 weeks, so not looking hard for Am. Restaurants… That’ll change in the future! Hey, just out of curiousity, do you guys think that “Fresh-mex” will do well in Shanghai? IE Baja Fresh, Rubios, etc? Is there a White Castle in China?